Who Stole Oswald's Stone, the Magic Middlesex Monolith? Millions live in or near Ossulstone, but only a handful have ever heard of it. Why and how has this place disappeared from common memory? Perhaps the when is easier to trace - to 1869, the year in which the mysterious object that lent its name to the area was stolen. Marking the intersection of two ancient London roads , at a place formerly called Tyburn but now known as Marble Arch, a monolith called Oswald’s Stone once stood. Until 1783, Tyburn was the place for public executions in London ; undoubtedly in part to erase that location’s lurid reputation, it was chosen as the relocation site for a large monument that was deemed out of place in front of Buckingham Palace . Nobody remembered what the stone was meant to mark  or even who Oswald was. Indeed, the rock was also called Oswulf's Stone. Unsure about what to do with the ancient monolith, the authorities interred it in 1819 - only to dig it up again in 1822. In later years, it was found leaning against Marble Arch. After an archeological journal highlighted its historical importance, Oswald’s Stone disappeared. It has never been seen since that fateful day in 1869. Presuming that the stone was removed by someone alerted to its value by the archeological article, it is not unthinkable that someone somewhere, perhaps a descendant of that 19th-century thief, is still holding Oswald’s Stone. Although, judging by the facility with which the last remnants of ancient names and meanings vanish from knowledge, perhaps he or she no longer knows why that stone was so important to great-grandpa. I accidentally stumbled across Oswald’s Stone - figuratively speaking of course - while looking for an answer to a question that had bothered me for some time: Where is Middlesex? Half a dozen Middlesexes survive as place-names in the US, Canada and Jamaica. But the original Middlesex , once one of England’s counties is defunct: small enough to begin with, it had the additional bad fortune to be encroached upon by London, and in the end be gobbled up piecemeal by the metropolis. The last vestiges of the county, whose name was first attested in 704 AD, were abolished on 1 April 1965, when nearly all that remained of Middlesex became part of Greater London . Middlesex may be dead, but it is not entirely forgotten: it leads a phantom existence in the names of Middlesex University, the Middlesex County Cricket Board, and the Middlesex County Football Cup. There’s even a Middlesex County Day (May 16th ) and a Middlesex County Flower (the wood anemone). You can still address letters to a number of postal towns  by adding Middlesex to the address, but adding the county is no longer required by Royal Mail. At its greatest extent, Middlesex, its southern border being the Thames, stretched from the river Lea in the east  to the river Colne in the west . Middlesex’s only land border was to the north, and followed a ridge of hills , including Oxhey Hill (438 ft.), Harrow Weald Common (475 ft.), Bushey Heath (504 ft.), Deacons Hill, Edgware (478 ft.), and Highwood Hill (443 ft.). 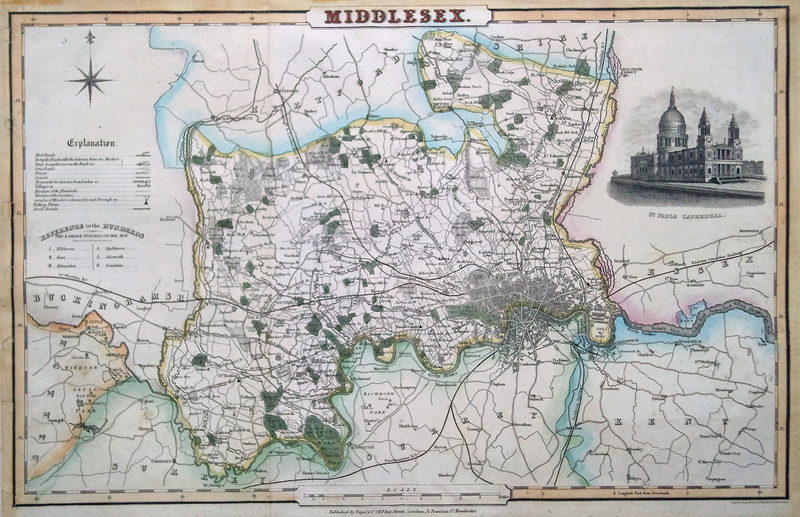 Like the other 38 historic counties of England, Middlesex was divided into hundreds. In Saxon times, a hundred defined an area large enough to sustain 100 households. Until they were replaced by districts in 1894, hundreds were the only administrative unit between counties and parishes, and were the essential locus for dispensing justice, raising soldiers and discussing the affairs of the day. They were usually named after the place where the men of the area gathered to witness the dispensing of justice, the raising of armies, and the debating of matters of state. One such place was Oswald’s Stone, the other five Middlesex Hundreds being Edmonton, Elthorne, Gore, Hounslow and Spelthorne. The City of London, nominally part of Ossulstone, became a self-governing county in the 13th century. From 1585, the City and Liberty of Westminster also attained a degree of autonomy from Middlesex. London, and to a lesser extent Westminster, would become the names attached to the capital of England, and later of Britain, and of the urban growth that this position allowed. Middlesex was merely the canvas over which this expansion was poured - its only option to absorb the growing metropolis, and retreat from it. In 1889, county councils were introduced in England. About 20% of the area, and 33% of the population of Middlesex - taken from Ossulstone, the most densely populated hundred - was transferred to the new County of London. Ironically, the new Middlesex County Council met in the Middlesex Guildhall, located in… the County of London . London’s expansion proved unstoppable, due to better transport links, especially the extension of the Metropolitan Tube line to the northwest of London into a rapidly suburbanising area known as Metroland. This cut right into what remained of Middlesex exceptionalism - which in the context of the expanding city meant: a rapidly rarefying ruralism. The death blow came in 1965. Middlesex nevertheless lives on. Some even dream of a Greater Middlesex, encompassing not just the historical County of Middlesex (which preceded the much smaller Middlesex County Council), but also ‘tribal areas’ from the Chiltern Hills in the west, to “somewhere near Luton” in the north. "The current Government are keen to bring in regional government for England. This will almost certainly mean the abolition of all County Councils, so from Herts to Surrey everyone will end up in the same boat as Berks and Middlesex. It is possible that with the current review the regions of England will be based on the kingdoms and provinces of the Anglo-Saxons." Well, why not? But something tells us they’d have to find Middlesex’s ‘palladium’ first. As yet, however, the only tangible remnant of the missing monolith is Ossulston Street, leading off the Euston Road past the British Library. So if you have an antique stone in your basement that emits a strange glow at night and low moans at full moon, let us know: it might be Oswald’s Stone, pining for Tyburn. A modern, practical interpretation of ancient county: the catchment area of the Middlesex Association for the Blind.